‌Regional actors have kicked off a process to reshape and strengthen the ECOWAS Common Agricultural Policy (ECOWAP) to meet the new challenges facing West Africa and its population. Ten years after the official launch of the regional agricultural policy, the ECOWAS Commission and its partners are taking stock of its achievements and prospects. Senegalese President Macky Sall chaired the opening ceremony of the International Conference on Agriculture in West Africa (ECOWAP+10) which was organised by the ECOWAS Department of Agriculture, Environment and Water Resources in collaboration with the Government of Senegal and NEPAD. Among the key topics on the agenda, participants discuss agricultural productivity and funding modalities for a regional offensive for sustainable rice production. Ahead of the conference, a technical experts' meeting was held from 3-7 October in Lomé to lay the groundwork for the high-level gathering. The ECOWAS Commission also carried out a participative assessment of the impact of implemented actions and to capitalise on lessons learned. At the request of the Commission, the SWAC/OECD Secretariat has submitted a briefing note on the impacts of changes in the agro-food economy. The analysis focuses on the role of the regional market and population dynamics. Based on the various contributions, the debates in Dakar will result in an update of the Common Agricultural Policy. This will inform new priorities that will be incorporated from 2016 on into updated versions of the National Agricultural Investment Programmes (NAIP) and the Regional Agricultural Investment Programme (RAIP). The transformation of food systems is one of the major challenges of the coming decades in West Africa. Systems need to adapt to changes in demand if the region is to take advantage of opportunities afforded by the size of its domestic market. Today 45% of the West African population lives in cities. Rapid urbanisation has resulted not only in an increase in the number of non-producing consumers but also in qualitative changes in demand; these two trends are powerful engines of agricultural transformation. Agricultural policies need to adapt. At least two-thirds of food needs are provided by the market at the regional level. The food economy is the number one economic sector in West Africa. It represented USD 175 billion in 2010 , approximately 36% of the regional GDP. Food value chains are becoming longer and more complex. Agriculture remains essential, but 40% of added value in the food economy is now the result of non-agricultural activities. Institution building through (i) gender-sensitive approaches, (ii) support for capacity building in the formulation of agricultural and rural policies and strategies, (iii) long-term funding for agriculture, (iv) communication, (v) capacity building in steering and coordination, (vi) capacity building in monitoring and evaluation. Stronger focus on the post-harvest segments of food value chains and develop integrated agricultural policies. Oxfam International is calling for improved co-ordination and increased harmonisation of agricultural policies in West Africa. The UK-based NGO has published an analysis of the ECOWAS Common Agricultural Policy on the tenth anniversary of its adoption. The paper argues that with various regional initiatives competing for attention at the political and the project levels, within a complex and fragmented institutional context, co-ordination remains a serious challenge. In order for the ECOWAP+10 review process to succeed, the paper urges stakeholders to rationalise the mandates and resources of regional institutions, streamline co-ordination mechanisms for development partners and ensure that ECOWAS plays a central role in financing and implementing regional programmes. It also calls upon development partners to stronger support the political leadership of ECOWAS and better align their strategies and programmes with the region’s priorities. "It is essential for the first 10-year review process of ECOWAP to bring about a strong political commitment shared by all actors for a single common agricultural policy in West Africa", indicates the paper. 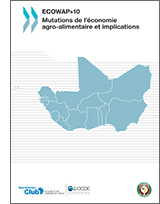 The briefing note is published within the framework of a series on aid effectiveness in the agriculture and food sector of West Africa, launched in 2009. “Agriculture remains an essential pillar of the West African agro-food economy, but 40% of value added in the food economy is already being created by non-agricultural activities”. In his most recent SWAC blog post, Thomas Allen, economist at the SWAC/OECD Secretariat, presents some key messages from current SWAC work on transformations in the West African food economy. The analysis was prepared as input for the International Conference on Agriculture in West Africa (ECOWAP+10). He discusses the major changes that occurred in West Africa over the last six decades that are deeply influencing the region's economy and society. Agricultural and food policies need to adapt!